he player creates a black work of art. 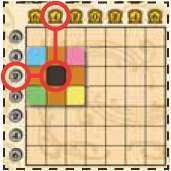 He takes a black work from those placed near the gameboard. He may sell this work through the Sale action of the Art Nouveau board. The sale will be conducted under the same rules as the color works. Of course, it is forbidden to sell a black work if a black work is already on display in the shop. Profits from the sale are indicated by the center of the Workshop cursor. The player earns 1 VP per work he has before him (including black works). The player can activate a Public Figure card from those upright before him. He benefits from its effect immediately, and rotates it 90°. The player can take one Noble Material cube of his choice from the general supply. The player earns 1 VP per building he has already built on the Art Nouveau board. Example: The green player has sold a black work of art. After having moved the Workshop cursor, the cursor indicates an income of 2 BF and 4 VP.